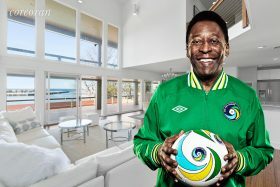 Brazilian soccer legend Pelé’s former Hamptons beach house recently sold, the New York Post reports. The seven-bedroom home at 156 Waterhole Road in Springs changed hands for $2.85 million, below its most recent ask of $3.25 million. The famous footballer won three World Cups during his career, which ran from the 1950s to the 1970s when he played for the New York Cosmos. Pelé–born Edson Arantes do Nascimento–bought the waterfront ranch house for $156,000 in 1979 and expanded it into its two-story, 3,400-square-foot form. Located on a landscaped acre next to Clearwater Beach and marina, the unassuming-on-the-outside house with sleek, recently renovated interiors also includes a pool, an outdoor shower and deeded access to the beach. Pelé, who is 77, lives in Brazil. 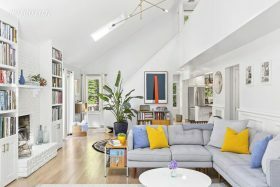 This three-bedroom East Hampton rental on a half-acre of landscaped greenery could be the perfect place to spend an end-of-summer getaway week (h/t Curbed). 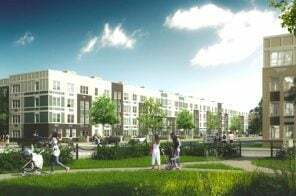 Dressed to the nines in on-trend decor and fun, fine finishes, this vacation home comes complete with heated pool, grill and outdoor fireplace for $12,000 a week in season or $40,000 a month ($20K after Labor Day). The East Hampton family home of actress Jemima Kirke, who starred as Jessa in the HBO series “Girls,” has hit the market for $2.9 million. The cute four-bedroom home sits on Gardiners Bay and includes its own private beach. 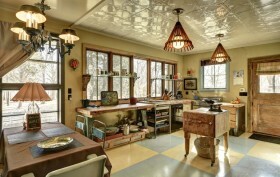 As Curbed learned, the home, built in 1900, has been renovated by Jemima’s interior designer mother, Lorraine Kirke. 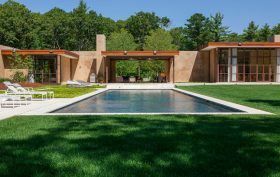 This gorgeous East Hampton property is located on a 20-acre site that was surveyed and designed by architect Michael Haverland in the format of a “campus” rather than one large suburban home. It’s arranged around a series of courtyards and gardens to take full advantage of the subtle undulations of the site’s organic topography, providing room for an L-shaped main house, pool house and 25-meter pool, gym, spa, and tennis court. This East Hamptons home comes with serious history. Not only was it built way back in 1639, but the facade comes from the wood of a ship and the structure is still held together by the original wood pegs. 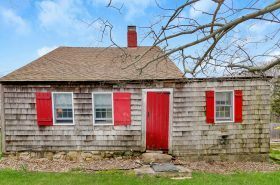 According to the broker, the East Hampton Historical Society has actually verified the house history as well as the ship’s numbered wood, the oldest part of the home. (The wood is numbered because, in the event of a shipwreck, it could be put back together.) 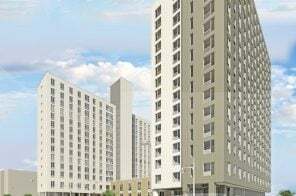 They can also trace the property’s family history all the way back to its earliest owners. Now, on the market for $1.25 million, it’s ready for its next chapter. 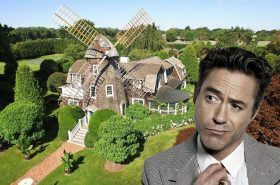 Sources tell Behind the Hedges that “Iron Man” actor Robert Downey Jr. bought the historic Edward DeRose Windmill Cottage on East Hampton. Built circa 1885 to resemble a local windmill (it was never functional), the home sits on four acres and boasts a seven-bedroom main house, two-bedroom guesthouse, three-car garage with a potting shed, 50-foot pool, tennis court, and gorgeous landscaped gardens. It’s been on and off the market since 2014 when it listed for $13.5 million. 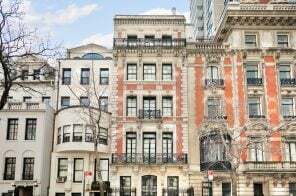 The following year, the price dropped to $11.5 million, but property records show a sale last summer for $10.5 million disguised under an LLC. 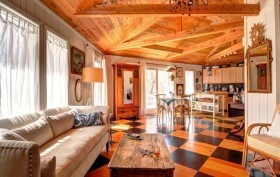 The listing for this .28 acre East Hampton property is billed as “the ultimate beach cottage” and we’d have to agree. It’s owned by the English drummer Simon Kirke, best known for playing with the bands Free and Bad Company. There’s the main house, which was recently renovated, as well as a deck, pool and rear cottage currently configured as a music studio. The whole package, located right on Accabonac Harbor, has views of the harbor to the west and of Gardiner’s Bay to the east. New Yorkers are always looking for new ways to stay young, and the next health craze may be just a bridge or tunnel away in Long Island at the Bioscleave House in East Hampton. 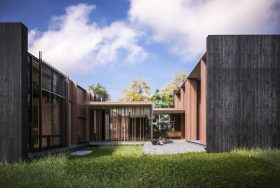 Arakawa and Madeline Gins are the masterminds behind the house, which is also referred to as the Lifespan Extending Villa. 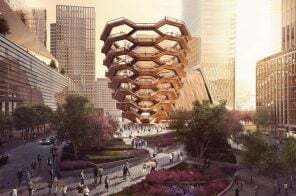 The duo’s design philosophy is to combat mortality by creating architecture that makes people use their bodies in unexpected ways, challenging them to maintain equilibrium, in turn stimulating their immune systems. “They ought to build hospitals like this,” Ms. Gins told the New York Times in a 2008 interview. 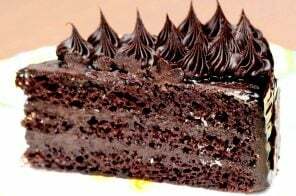 Although the idea sounds fascinating and beneficial for all, their out-of-the-box methods might not be exactly what you’d expect. 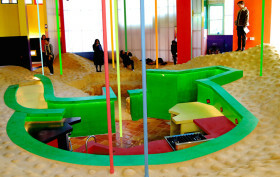 With undulating floors–possibly unsafe for children–and a variety of other disorienting details, the verdict is still out on whether or not their methods will, in fact, reverse the aging process as they claim. It’s not all Real Housewives of NYC and mega-mansions out on the Hamptons. In fact, one of the cutest houses on the island (in our humble opinion) is on the market for just $595,000. Located in East Hampton at 73 Waterhole Road, this beach bungalow stands out on the exterior for its charming hexagonal shape and on the interior for its funky hand-painted checkered floors and rustic cedar beamed ceilings. And if that wasn’t enough, the house sits on a large lot adjacent to a preserve and near a private residents-only beach and marina.